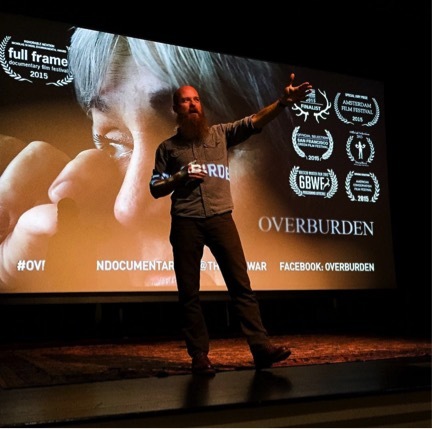 “Overburden” played at the Wilma Theater as part of the 2016 Big Sky Documentary Film Festival later that same day. The film follows two women in the heart of Appalachian coal country and their fight to save Coal River Mountain from the Massey Energy Company after an underground fire kills 29 miners. Stevens said the first iteration of this project began while he was working on his master’s thesis at Ohio University. However, his moment of inspiration began several years earlier, in 2003, during his time as a photojournalist-in-residence at Western Kentucky University. One day, Stevens and a friend were driving through the hills when they crested a ridge and Stevens got his first look at a mountain top removal site. “There was a shocking amount of destruction,” he said. Chad A. Stevens speaks to the audience a screening of “Overburden” in Boulder, Colorado. Photo by Erin Hull. Originally Stevens focused on the environmental aspects of coal mining. He photographed events at the Mountain Justice summer convergence and followed the activists who chained themselves to bulldozers at the top of Coal River Mountain. Yet Stevens realized that this story lacked the intimacy to connect with a broader audience. He looked to the valley where people lived right below the mining sites, whose blasts shook their homes’ foundations. It took Stevens about two years to gain the trust of one of his main characters, Lorelei Scarbro, who had seen plenty of journalists disappear after getting their pictures and quotes from the community. Yet Stevens referred to time as a gift and said it allowed him to understand what mattered most to Scarbro and her battle against coal. One of the project’s major turning points came on April 5th, 2010, when a methane leak and an errant spark caused an explosion in the nearby Upper Big Branch mine. A second main character emerged—a pro-coal activist whose brother died in the explosion and spurred her to join Scarbro’s fight. Stevens also realized that the film’s central theme switched from an environmental perspective to more economy-based story, which explored how extraction-based economies limit local communities. “I actually paid an editor to edit my film because I felt too close to it,” Stevens said. Now a tenured professor at the School of Journalism and Mass Communication at the University of North Carolina in Chapel Hill, Stevens has his own mantra for students to learn. “Overburden” is currently available for rent on iTunes, Amazon, Google Play and Vudu. Check the film’s website or follow its Facebook or Twitter accounts for details about upcoming screenings. To learn more about UM J-school affiliates reporting on coal communities in Montana, check out second-year graduate student, Andrew Graham’s contributions to National Geographic’s blog The Great Energy Challenge, and adjunct professor, Matthew Frank’s publications on Mountain West News.